You can’t travel to a country without visiting it’s capital. Santiago is stunning a metropolitan city encircled by the snow-covered Andes. The city has a buzzing nightlife in the areas known as Bellavista and Providencia; the atmosphere is lively with upbeat restaurants, bars and clubs. As well as an incredible nightlife, Santiago is also home to some beautiful museums and historic sites. Be sure to visit the Plaza de Armas and La Moneda Palace. The most popular place in Santiago is the Cerro San Cristóbal (San Cristóbal Hill). Rising approximately 860 metres above sea level, the Cerro San Cristóbal provides 360° views of Santiago and on a clear day, you can see the Andes as well. Situated on the central coast of Chile, Valparaiso is a town known for its hilly regions, colourful houses and bohemian culture. One of our most favourite cities, Valparaiso is filled with street art, museums, incredible architecture and spectacular views of the Pacific Ocean. The bohemian culture and remarkable street art of Valparaiso are perhaps its most defining selling points. At every corner you’ll find marvels of art across walls creating a colourful and enticing environment. In addition, the surrounding hills of Valparaiso are filled with outstanding views, artisan shops, independent galleries, gorgeous cafés and restaurants, as well as an abundance of breathtaking buildings. There are over 40 buildings to explore, start with the two most popular: Cerro Alegre and Concepción then go from there. Easter Island is a very mysterious and quite isolated island, located on Chile’s Pacific Coast. Also known as Rapa Nui, Easter Island has been depicted in movies, TV, books, magazines and all over the Internet. 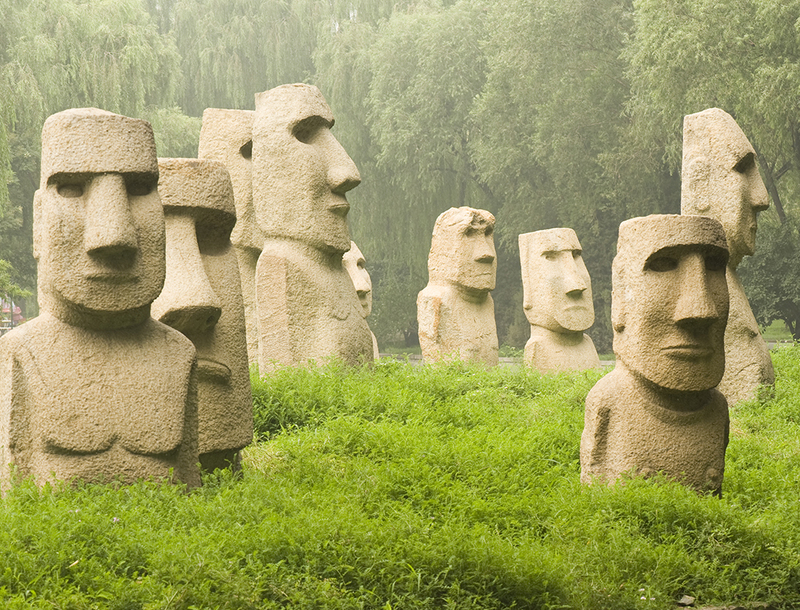 Famous for its 887 Moai statues scattered across the 163 square km land, you can’t visit Chile without visiting Rapa Nui. Theories are still circulating regarding the purpose and process of these amazing human-like stone figures. It is estimated that construction took place between 1200 and 1600 A.D. There are many places on the island to visit, however, arguably the two best sites to visit are the Rano Raraku quarry and Ahu Tongariki. Rano Raraku is said to have been the only production site for the Moai because of its plentiful source of volcanic tuff, and today holds nearly 400 of the Moai in various positions. Perhaps the most visually astounding of the many “ahus” (platforms) around the island; Ahu Tongariki where you can see 15 breathtaking Moai statues (one as tall as 40 feet) near the coast’s edge with the cliffs of Poike in the background. Second only to Easter Island, the Atacama Desert is Chile’s most popular tourist attraction. The world’s highest and driest desert; Atacama features widespread salt marshes and lake oases surrounded by volcanoes, bizarre giant rock formations, and scattered abandoned houses of Chile’s indigenous people. The main tourist hub of the desert is San Pedro de Atacama. A small town located in the middle of the desert with two main attractions, the R. P. Gustavo Le Paige Archaeological Museum and the Church of San Pedro. Approximately 13km from San Pedro de Atacama, The Valle de la Luna is one of the most awe-inspiring sights of this magnificent desert. Earning its name from its moon-like sand and stone formations; this “Valley of the Moon” is the result of centuries of winds and floods on the sand and stone of the region. While in Atacama, be sure to visit the Valle del Arcoiris (Rainbow Valley), and the Valle de la Muerte (Death Valley). While the terrain and topography are marvels in themselves, the absolute highlight of Atacama Desert is the night sky. Atacama’s dry and remote conditions as well as 8,000- to 14,000-foot elevations allow for unspoiled constellation spotting. South America’s Patagonia region boasts the snow capped Andes mountain range. This beautiful mountain range spans across the southern most tip of both Chile and Argentina. Located in the southern most region of Patagonia is The Torres del Paine National Park. Featuring mountains, lakes and glaciers, the centrepiece of the park are the three Towers of Paine, three spectacular granite peaks shaped by the forces of glacial ice. We recommend doing multi day hikes or walks to truly experience what Patagonia has on offer. Explore everything from glaciers and forests to impressive mountain ranges, lagoons and rivers. Another must see in Patagonia is Puerto Rio Tranquilo. Located on the shores of the Lago General Carrera (General Carrera Lake), Puerto Río Tranquilo is home to the famous marble caves. Thousands of years of wind and water erosion have created these cave formations. Visit them via boat or kayak. The spectacular colours of the caverns and the crystal clear water of the lake below are completely awe-inspiring. There is so much more to do in Chile. Whether you are seeking history, culture, art, architecture or natural wonders, Chile delivers it all. Each time you visit you’re sure to discover somewhere or something new and exciting. So what are you waiting for? Pack your bags and jet off your Chilean adventure!